Welcome to my stop of the RED WHTE AND BLUE celebrations. Thank you Madame Samm and Jane for putting the party together. I hope you enjoy what I have to share with you today. I used the EZ Dresden Ruler designed by Darlene Zimmerman for this beauty. I was happy that it came with a table for block size, directions and illustration to follow. Very simple and I have another ruler to giveaway. Earlier this year, I took up paper piecing. I used a 5-point star paper piece designed by Carol Doak. Here is another star paper piece 2 1/2" x 3 1/2" ATC. That is my show for today. Enjoy the rest of blog hop by clicking on the next link below. Now, I did mention a giveaway! I have one EZ Dresden Ruler designed by Darlene Zimmerman. If you like a chance to win, leave me comment before Saturday midnight central time July 7th, 2012. Please be sure that I have a way to contact you. You can use (america at usa dot com) if you feel comfortable. Great Dresden table topper, but I love tiny, so your little heart is thrilling. Thank you for sharing with us today. The first one is my favourite but they are all lovely! Thanks for sharing. Your Dresden plate block in beautiful, but I also like paper piecing. Thanks so much for sharing. I LOVE the Dresden block. I have been wanting one of these rulers for a long time. Thanks for the giveaway. Morning Judith...your blocks are striking...sew much sew I think one made it in our top 2...oh yes it did ..
Great blocks! Love the Dresden. Thanks! Good Morning Judith! I love the richness of the colors on your block. It is stunning. My next challenge is to learn how to paper piece..Thank you for sharing! I'm loving all the Dresden blocks that I'm seeing around blogland lately. Thanks for such a beautiful version. Love that Dresden plate...exquisite details with the quilting! And I love your star block! Way to go! I admired your block using the Dresden plate pattern. Winning a ruler would let me try it too. Thanks for the show. How very beautiful and what a great job. Thanks for doing the hop. Your Dresden Plate block is amazing! Beautiful dresden plate...thanks for sharing all of your lovely blocks! Your bag caught my eye but your dresden plate intrigued me. It is beautiful! great blocks but don't enter me in the giveaway I have ruler and love making dresdens. I really like the quilting you did on your dresden block. I've never tried putting one together but I might give it a try now! Beautiful work, thank you for sharing. I don't have the ruler and it would be fun to win it. Your blocks are great! I'm enjoying the blog hop. I love your blocks and I do not have this ruler and have wanted to try making a Dresden quilt. I think I would use your inspiration and start with just one block before tackling a whole quilt. Thanks for the great giveaway. Your blocks are beautiful. I love the Dresden one best. I think I need to get one of those mini quilt holders. I love your blocks, especially the Dresden plate. I want to try to make some of these too. I also love to paper piece and Carol's blocks are my favorite. I like your blocks! I like the star blocks but the Dresden plate one turned out so nice! I think the contrast in colors is great! I just Love your Dresden Block, and the colors are just great!! I am a Dresden addict I just Love them! I have never attempted to make one and didn't know a special ruler even existed. Needless to say I would Love to Win!! and if I don't thanks for including the Info here as to what I need to look for!! I am really having fun hopping around to see all of these blocks. They are gorgeous. Hi, Your Dresden Block is beautiful. I have never made one, I just admire the blocks others make that seem so impossible to me. I did not know of that ruler, and sure would like to win you prize and try to make my own. Actually, I just need to get one if I don't win, I have to try to make a block like yours. Your blocks are great thank you for sharing. When I clicked into your blog and saw that dresdin plate block all I could say is WHOOO. That is a great block, and I would love to have that ruler. Pretty Dresden Plate mini quilt...love the quilting!! Your blocks are fabulous! I tried paper piecing yesterday and made a BIG mess so I can appreciate your skills! Isn't there a contest with the EZ Dresden ruler somewhere in blogland? You should enter your block--it's a winner! I love your dresden plate done for the 4th! Wish I had thought of it. Thanks for the give-a-way. How patriotic they both are!! I would love to be entered for the dresdin give away. Thanks. As I was reading your post, I was thinking how cute your Dresden Plate block was and how I need to get one of those rulers, so I really hope I win your giveaway. Your Dresden Plate block is cute! Makes me want to make one too! Hi Judith! What beautiful blocks! I'm glad you like paper piecing and Carol Doak! The way you finished the Dresden plate is stunning! I put that on my favorite bar! Thanks for sharing! Hi Judith. Great blocks. Fingers crossed that my post will be picked! I'd love to win the ruler. Great blocks. I like the look of paper pieced blocks, but haven't quite got the technique down. Your star looks super. Please do not put me in the giveaway. I already have the ruler and love using it. Would love to win a dresden ruler. Thank you for the chance. Dresden ruler? I'm in for that one! New follower. Thanks! THANK FOR A CHANCE TO WIN A DRESDEN! I'd love to win the dresden ruler! Thanks for the chance! 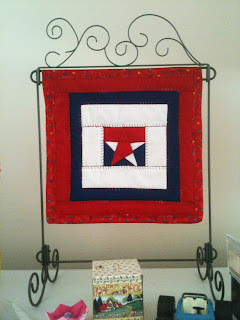 Thanks for participating in the Red, White and Blue blog hop! This is such a fun hop!!!! Your blocks are great!!!! Your Dresden Plate mini quilt looks amazing. I really like the stars that you quilted on it. Thanks for the chance to win a ruler. Your blocks are amazing! You certainly don't disappoint! Happy Hop Day, Wow, just amazing work! Great job, thank you for playing. I've not made a Dresden yet, but I am loving all the different dresdens showing up on quilt blogs! I am not familiar with the EZ Dresden Ruler, but if it can make toppers like the one you made, I'd love to give it a try! I've been wanting to try the ruler. I've made Dresden plate many other ways, but everyone seems to love the ruler. Your block is beautiful and I see the table runner too. Thanks for the giveaway. All of your blocks are lovely especially the plate. Your Dresden is stunning! I love how the navy blue makes the red and white pop! I love your Dresden , just gorgeous ,thanks so much for sharing and for the chance to win the ruler , that would be awesome. I am loving this blog hop!! Your dresden mini quilt is very sweet - thanks for sharing!! All the blocks are so wonderful! I love the dresden the most! thanks! Loved all the details in your blocks!! The blocks turned out great. You should be proud of yourself. Thanks for the chance to win the ruler. Love your blocks! Enjoyed my stop! Enjoyed viewing your RWB blocks ~ love stars! Thanks for the opportunity to win one of the wedge rulers. All yout blocks turned out great but I especially like the Dresden plate one. How wonderful it turned out with the red, white and blue. Thanks for the chance to win the ruler. I have never made a Dresden before. Love the Dresden plate block, very pretty. 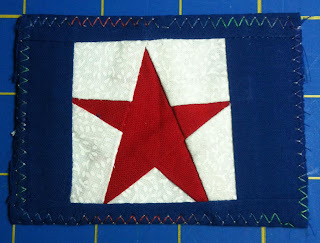 Love the quilted stars in the corners. Your blocks are beautiful, especially the Dresden plate, just lovely! I'm new to quilting, so anything right now would be a great help to me---love a chance to win the ruler. Have a great day, blessed be, hugs!!! WOW doesn't even begin to cover what I think about your blocks!! I went out earlier to day to a quilt shop looking for that Dresden ruler without much luck. Seeing you block and the tablerunner that you made just makes me want it more!! Now I'm hoping for newbie follower's good luck so that I might win your little ruler. Thanks For the Chance to win! Love your blocks! The bloghop is lots of fun! Thanks for having a giveaway. Judith, your blog is beautiful and your blocks are very, very nice! Thank you so much for sharing them :) I've become a follower of yours just so I can come back and visit your sweet treasures! Your quilting on the dresden is great! Thanks for sharing your blocks, and the giveaway for the ez dresden ruler. Beautiful blocks you have shown us. The Dresden is my favorite block already and yours really made it look elegant. I absolutely love the blue fabric you've used. It is such a gorgeous rich color of blue. Love the Dresden block, the quilting really sets it off. Thank you for the inspiring block...and the wonderful give-a-way. I like your star block but I have to say, I scrolled on down and saw the RWB Dresden plate table runner!!! Oh my goodness, that is so lovely!! You should have featured that on today's blog as well!! Oh I would sooooo love to win the ruler!! My 7 yr. old Granddaughter saw the Dresden plate design and wanted one of the rulers she read about (she is an obsessive quilter and stitcher at age 7!!) I would most definitely give her the ruler if I won!! Beautiful blocks, always love dresdens! I managed to do a mixer cover with Dresden plates on each side - but I didn't have a ruler, I just winged it. I was lucky, and they laid flat & were mostly even, but, whew, it wasn't easy! I LOVE your table runner & block!! Thanks for sharing them with us all!! And thanks for the chance to win a cool tool!! Love your block and I have to say I would love to have the ruler. That's a great little bag you made with your block. I'm going to do some of those, soon. I'm a new follower of you and hope you'll visit us at Prairie Cottage and follow me, too. Thanks for letting us visit. Your blocks look wonderful. I love dresdens and I've also been trying a little paper piecing lately. Thanks for the chance to win the ruler. Hi Judith, I found your link on Carol's group. I am glad I found it your site is really cool. I am bookmarking you so I can come back regularly. Great work and I love the Dresden I am about ready to attempt my first one. What a neat block. Love that you only used three colors and did stars for the quilting. I've been learning paper piecing. I could probably handle a star. hehe. Thanks for sharing! I have ALWAYS wanted to do a dresden and have jsut not gotten around to it! I have a STASH of 30's prints (I am a traditional kind of gal that way) and someday... it wil happen!! :o) I LOVE yours!! I love your little quilts. I recently bought a small quilt display and am anxious to make a tiny quilt for it. I may mimic one of yours. Thanks for the inspiration! I'm always looking for something that I haven't tried. This would be fun. Thanks. Dresdens are so classic, thanks for the giveaway! Your blocks are happy and inspiring! Love the dresdon! would love a ruler to use. Thanks for sharing the designs and the giveaway. I love your blocks. I have wanted to try a dresdon so the ruler would be perfect. Thanks for the chance! Cute blocks I've made Dresden blocks before but with English paper piece not with a ruler. Thanks for sharing. The best things about hops are they introduce you to blogs that you didn't know existed. Glad I found yours and now you have a new follower - me! Love the dresden block and the stars in the corners. Like the fact that you used a cookie cutter for the template. I love your Dresden block, and I also love paper piecing! Love dresdens. Your blocks are wonderful and it's so nice to meet you! Your blocks are beautiful! Thanks for the chance at the giveaway! The dresden pattern is indeed pretty. it is the first pattern that I ever made. I did not have this lovely ruler or a rotary cutter as I made it as a teenager and it is awhile since I have been a teenager. It makes smile thinking how far we have come in the notions department.